The Harvesters are 3-3 in conference play after going 1-7 out of conference against a strong non-conference slate to start the season. Tate said he was not able to recruit or tryout players since he was hired on after that period. He also had no say in the schedule. The team also only has four returning sophomores of the 20 players on the roster. The comparatively small roster has made not only games more challenging, but practice as well. It also allows the team to do full scrimmages in practice. “You can get some 11 vs 11 games that we haven’t been able to do all year,” Tate said. 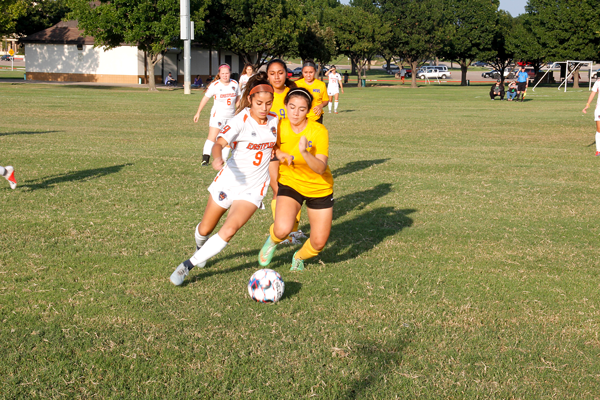 Eastfield opened the year with an out-of-conference schedule that included NJCAA Division I schools like Cisco College, Ranger College and Seminole State College. The team even faced off against some NCAA Division III schools like University of Texas at Dallas and Louisiana State University Shreveport. With a group of primarily freshman and a new coach, there was no real established culture within the team. The Harvesters have been inconsistent in the early season, losing 10-1 to Richland College one day and then beating Southwestern Adventist University 10-0 the next. The Harvesters have found more success against fellow NJCAA Division III schools than in their out-of-conference schedule. The team beat Cedar Valley (0-6) twice and Mountain View (2-4) once, while losing to Brookhaven (6-0), Richland (5-1) and North Lake (2-4). The conference games, outside of the Mountain View game, have lopsided scores, with one team clearly outscoring the other. They have wins with scores of 4-0 and 3-1 and losses of 6-1, 10-1, and 3-0. The game against Mountain View was a 1-0 win, with freshman midfielder Emily Garcia scoring the lone goal 57 minutes into the match. The team faces Mountain View, Brookhaven, Richland and North Lake again before the end of conference play. With his inaugural season almost at an end, Tate has begun looking towards his next campaign.